One of the senior figures behind Deutsche Bank&apos;s decision to move to Brindleyplace said she was excited by the &apos;immense talent pool&apos; among Birmingham&apos;s graduates and professionals and this helped to cement the decision to take a base here. Kathryn Harrison, UKMEA business partner and a member of the team which conducted a review of its global operations, also said the bank was able to feel like "more than just an employer" here as it prepares to open a massive new operation. 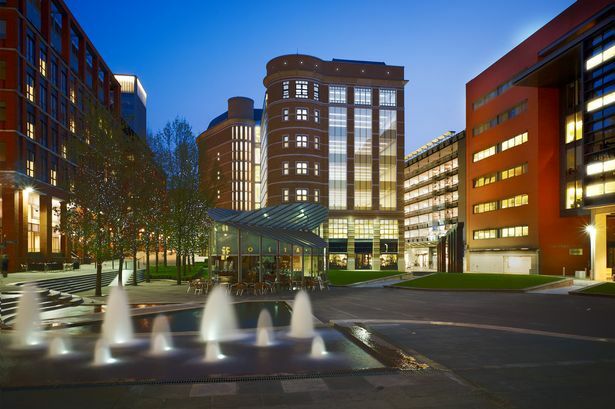 The German bank, which currently has staff based in Baskerville House and One Brindleyplace, is due to move into 134,000 sq ft of office space in Five Brindleyplace in July after signing a 15-year deal to take the entire building. The deal, announced last October , is expected to double its 1,000-strong workforce in the city, a stark contrast from the 30 staff it had when it launched here in 2006. She said: "What&apos;s exciting about Birmingham is the talent pool here. When we looked into what&apos;s actually available in the market, we were really surprised by the quality and depth of the skill sets we could tap into. "Five Brindleyplace is effectively an integrated service centre for us so we&apos;re looking for legal, financial, engineering and IT skills - the full spectrum of things which would support a large investment bank. "We&apos;ve been very successful in hiring for our trading function and we will be the largest trading bank in Birmingham. "One of the really nice things is we&apos;re managing to attract the city&apos;s alumni which, maybe historically, has had to leave Birmingham for places like London to have those careers in the financial services. "It&apos;s really exciting to be attracting that alumni back so we&apos;ve got this immense talent pool at a price point the bank can find sustainable long term which is very important." Ms Harrison was speaking at a seminar on the regional markets at the British Council for Offices&apos; Annual Conference in Birmingham. Deutsche Bank&apos;s move to the city is part of its wider &apos;Footprint Programme&apos; which has looked at reducing its cost base and taken in around 190 global cities, with similar deals struck in Warsaw, Bucharest and Jacksonville. Ms Harrison praised the work of Marketing Birmingham and its chief executive Neil Rami, describing the body as "instrumental" in helping the bank understand the local market and introducing the various opportunities in the city. "As an employer, we were welcomed with open arms and that&apos;s important to an investment bank like us as we&apos;re quite community orientated," she added. "Coming in to cities where we feel we can be more than just an employer is a very important factor and had one of our highest weightings when we were analysing where to come to. "The choice to come into Birmingham was a lot more than just whether there was a building there. Clearly, this started with the need to attack the cost base but it&apos;s ended up as something far more than that."